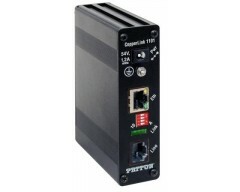 Perfect for bandwidth-intensive applications the CL1214 delivers off-the-chart symmetrical line rates greater than 100 Mbps. Best of all—like all CopperLink™ products—the CL1214 leverages existing copper infrastructure to deliver high speed Ethernet connectivity over voice-grade twisted pair, Cat 5e/6/7, and—new to the CopperLink™ line—coaxial cabling. Four user-selectable configuration profiles—combined with Patton’s auto-rate adaptation feature—ensure maximum achievable symmetrical or asymmetrical rates for the installed noise environment, wire gauge/type and length. Realize fiber-like speed and distance without the expense of fiber with Patton’s Ultra-High-Speed CopperLink™ Ethernet Extenders.